Pictures: Christian G.E. Schiller with Chianti Classico Wine Consortium President Marco Pallanti in Radda in Chianti at the Santa Maria al Prato Convent. Marco Pallanti is also owner/winemaker of/at Castello di Ama. Following the 2011 European Wine Bloggers Conference in Brescia, I spent three days in a beautiful and exciting location – in the Chianti Classico zone in Tuscany, at the invitation of the Chianti Classico Consortium. We visited several wineries and tasted perhaps as many as 70 different wines from Chianti Classico producers, both big and small. This is the second in a series of postings. I have already posted Blogging, Wining and Dining at the European Wine Bloggers Conference (#EWBC) October 2011 in Brescia, Italy – A Tour D’ Horizont. In the year before, the EWBC took place in Vienna, Austria: The 2010 European Wine Bloggers Conference (EWBC) in Vienna. Tuscany is Italy's third most planted region (behind Sicily and Apulia) but it is eighth in terms of output, reflecting both the poor soil of Tuscany and deliberate efforts to limit yields and increase the quality in the wine. After Piedmont and the Veneto, Tuscany produces the third highest volume of DOC/DOCG wines. More than 80% of the regions' production is in red wine, with the Sangiovese grape being Tuscanys' most prominent grape. Trebbiano is the leading white variety of the region. The history of viticulture in Tuscany dates back to the Etruscans in the 8th century BC. From the fall of the Roman Empire and throughout the Middle Ages, monasteries were the main purveyors of wines in the region. As the aristocratic and merchant classes emerged, they inherited the share-cropping system of agriculture known as mezzadria. Many Tuscan landowners would turn their half of the grape harvest into wine that would be sold to merchants in Florence. Following the end of the Napoleonic Wars, Tuscany returned to the rule of the Habsburgs. Chianti, Chianti Classico, Brunello di Montalcino, Vino Nobile di Montepulciano and Super Tuscan are Tuscany’s best known wines. Brunello di Montalcino is a red wine produced in the area surrounding the town of Montalcino, south of the Chianti region. Brunello, roughly translated as "nice dark one" in the local dialect, is the unofficial name of the clone of Sangiovese grown in the Montalcino region. Brunello di Montalcino is one of the Italy's best-known and most expensive wines. Compared to the nearly 18,000 ha of planted land in Chianti, Montalcino is a relatively small wine region with only 1,200 ha planted. Brunello di Montalcino (as well as Rosso di Montalcno) is made 100% from Sangiovese. The Vino Nobile di Montepulciano received its DOCG status shortly after Brunello di Montalcino, in 1980. The DOCG covers the red wine of the Montepulciano area. The wine received its name in the 17th century, when it was the favorite wine of the Tuscan nobility. Sangiovese is required to account for at least 80% of the wine. In the 1970s, a class of wines known in the trade as Super Tuscans emerged. These wines were made outside DOC/DOCG regulations, but were generally of high quality and commanded high prices. I was not fully aware of it before the trip, but the Italian DOC/DOCG system is a highly specific set of production requirements that is designed to ensure a certain quality and taste corridor for all wines from a specific DOC or DOCG. It is amazing, how detailed the production requirements are for a wine to qualify as a Brunello di Montalcino DOCG, for example. That the grapes come from the Brunello di Montalcion DOCG zone is just one of many requirements. The advantage of such a detailed and rigid system is that consumers have a very good idea of what they get when they buy a bottle of wine, both in terms of taste and quality: No surprises, as the taste and quality range of Italian DOC/DOCG wines is rather narrow compared to other countries. But this may also be a disadvantage. If, as a winemaker, you want to experiment and try something new, you have to leave the DOC/DOCG system and sell your wine as a Vino da Tavola or as a Indicazione Geografica Tipica (IGT) wine. And this is what a number of Tuscan wine producers did. By the 1970s, the market for Chianti wines was suffering and the wines were widely perceived to be lacking quality. Chianti was typically associated with basic Chianti sold in a squat bottle enclosed in a straw basket, called a fiasco. In response, a group of ambitious producers began to experiment. Some of these producers wanted to make Chiantis that contained more Sangiovese than allowed. Others wanted less Sangiovese and experiment with blending French grape varieties such as Cabernet Sauvignon and Merlot. Many did not want to be required to blend in any white grape varieties. Thus, the late twentieth century saw a flurry of creativity and innovation in the Chianti zones as producers experimented with new grape varieties and introduced modern wine-making techniques such as the use of new oak barrels. These wines became known as Super Tuscans, had to be classified as a Vino da Tavola or as IGT wine, while the prices and wine ratings of Super Tuscans would often eclipse those of the DOCG Chiantis. To begin with, the Chianti region is split between Chianti and Chianti Classico. Accordingly, two separate DOCG designations apply to wines from the Chianti region: the Chianti Classico DOCG for the heartland of Chianti, and Chianti DOCG for all other Chianti regions. The Chianti DOCG designation covers wines from six Chianti sub-zones (Colli Pisane, Colli Fiorentini, Colli Senesi, Colli Aretini, Montalbano and Rufina) as well as all other Chianti wines. The Chianti Classico DOCG is located in the very center of Tuscany, between Florence and Sienna. Chianti Superiore is a specification for wines produced with a stricter rule of production than other Chianti wines. Chianti Superiore wines can be produced only from grapes from the Chianti DOCG areas, not from grapes in the Chianti Classico DOCG area. The Chianti Classico region covers an area of approximate 100 square miles between the city of Florence to the north and the city of Siena to the south. 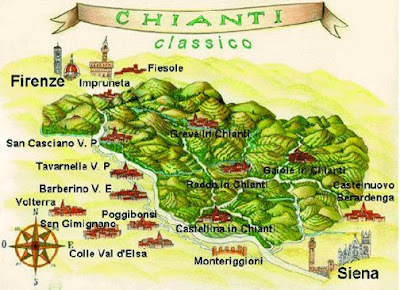 Historically, the Chianti Classico zone is where the production of Chianti started. In 1716, Cosimo III de’ Medici, Grand Duke of Tuscany, issued an edict legislating that the three villages of the Lega del Chianti as well as the village of Greve and a 2 mile hillside north of Greve as the only officially recognized producers of Chianti. This delineation existed until the 1930s when the Italian government expanded the zone. Subsequent expansions throughout the twentieth century would eventually bring the Chianti zone to cover almost all of Tuscany. The original zone of the edict of Cosimo III de' Medici would eventually be considered the heart of the Chianti Classico region. I spent 3 days in the Chianti Classico zone. It is a truly unending source of culture, scenery, architecture, gastronomy and wines. Here lie the lines of defense of the two Republics, Siena and Florence, which have scowled at each other through its woods and vineyards for centuries. Interspersed with the countryside are castles: some are still occupied by the noble families whose ancestors built them in the feudal middle ages; others - ruined, perhaps in battle centuries ago, and abandoned - still dominate their hilltops with proud arrogance. There are numerous hill towns and hamlets, villas and farmhouses, guarded by sentinel cypresses, by people who may make their living tending the vineyards, or have already made more than a living and have retired to beautiful old houses. Aged Chianti Classico wines are sold under the riserva label. Chianti Classico must have a minimum alcohol level of at least 12% with a minimum of 7 months aging, while Chianti Classico Riserva wines must be aged at least 27 months, some of it in oak, with a minimum alcohol level of at least 12.5%. In addition to producing Chianti Classico DOCG wine, the Chianti Classico zone also produces white wines, Super Tuscan wines, other red wines and Vin Santo (see below). Sangiovese is the signature grape of Chianti. It is the soul of Chianti wine. The Sangiovese grape, like the Pino Noir, is not an easy grape variety, but has the potential of producing world class wines. Since 2006, the use of white grape varieties such as Malvasia and Trebbiano has been prohibited in Chianti Classico. The share of Sangiovese can range from 80% to up to 100%, with the remainder either other native red grapes, like Canaiolo and Colorino, or international varieties, such as Cabernet Sauvignon and Merlot. Wines that do not comply with these rules – of which we tasted a number during the trip - cannot be sold as Chianti Classico. We stayed in Radda in Chianti at My One Hotel for 2 nights. Our tour started around mid-day in Radda in Chianti at the Santa Maria al Prato Convent. This is the future welcome center of the Chianti Classico Wine Consortium. We were received by the Chianti Classico Consortium’s President, Marco Pallanti. The first tasting at the Santa Maria al Prato Convent provided an overview of the Chianti Classico zone. Pictures: Santa Maria al Prato Convent and Christian G.E. Schiller with Silvia Fiorentini from the Chianti Classico Consortium. The Tour was very well organized under the leadership of Silvia. We started the afternoon with an overview tasting of Chianti Classico wines from different corners of the Chianti Classico zone in Radda in Chianti at the Santa Maria al Prato Convent. Pictures: Tasting of Chianti Classico wines from different corners of the Chianti Classico zone in Radda in Chianti at the Santa Maria al Prato Convent. We spent the evening at Badia a Coltibuono, an impressive abbey built by Vallombrosa monks about a thousand years ago. Badia a Coltibuono has been making wine since the Middle Ages. For over one 150 years, it has been owned by the Stucchi Prinetti family. On 70 hectares of vineyard located in the heart of Chianti, Chianti Classico, Super Tuscans and Vin Santo del Chianti are produced. Annual production: 400.000 bottles. The evening had 3 parts: A visit of the wine cellar; a cooking demonstration and dinner. Emanuela Stucchi Prinetti and her brother Roberto hosted a special dinner for the wine bloggers. The wonderful dinner was accompanied by excellent wine pairings. Prior to dinner we were treated to a cooking demonstration by Andrea Gagnesi, the Chef at the Badia a Coltibuono kitchen. He made pappa al pomodoro (dense bread and tomato soup). Pictures: Christian G.E. Schiller a cooking demonstration with Andrea Gagnesi, the Chef at the Badia al Coltibuono kitchen. We spent the morning at Castello di Brolio. Since 1141, the Ricasoli family has been making wines from the vineyards surrounding their estate, Brolio Castle, making it probably the world's oldest winemaking operation under continuous family control. The Castello di Brolio tour included 2 parts: A tour of the historic castle, where in 1872 the so-called Iron Baron, Bettino Ricasoli, created the original Sangiovese-based Chianti formula (blend), and a tasting of Castello di Brolio wines with Barone Ricasoli. After lunch at Castello di Brolio, we were treated to a tour of the fascinating art collection of Chianti Classico Consortium President Marco Pallanti’s Castello di Ama Wine Estate, with a tasting of the fabulous Castello di Ama wines at the end of the tour. 80% Sangiovese and 20% Malvasia Nera, Merlot and Cabernet Franc are planted on a vineyard area totaling 65 hectares. While Tuscany is not the only Italian region to make the passito dessert wine Vin Santo (meaning "holy wine"), the Tuscan versions of the wine are well regarded and sought for by wine consumers. The best-known version is from the Chianti Classico and is produced with a blend of Trebbiano and Malvasia Bianca. When we visited Castello di Ama, they were just in the process of taking down the dried grapes in order to ferment them. Vignamaggio located in the hills near Greve in Chianti was the next stop. The vineyard area totals 52 hectares and there are 11 hectares of olive trees. The Vignamaggio Wine Estate is another winery with an interesting history. The winery dates back to 1404. Mona Lisa was born there in 1479. During our visit we toured the property and did a wine tasting. Greve in Chianti is a cute little town and we had some time to walk around in the old part of Greve in Chianti before dinner. I like very much the Prosciutto di Greve in Chianti. The evening ended with a butcher-poet Dario Cecchini’s famous Solo Cicca restaurant in Panzano. Needless to say, we had good food and great fun that evening. In the morning, we spent a couple of hours with Paolo Cianferoni at his Caparsa Estate, which is a boutique winery. This visit was in stark contrast to the other winery visits and provided us with a different perspective of winemaking in the Chianti Classico zone. A lovely, very entertaining morning. Tour of the winery, tasting of old and new vintages and picnic on the terrace of one of Chianti’s most beautiful farmhouses: Villa Marangole. I missed this part of the tour (with all those wine bloggers who had to leave for Milan to catch a flight or a train). Great time in Caparsa. The information about wines and the people of the wine increase, with you! Many thanks.